I'm guessing that about half of you are saying, "Ewwww . . . " right now. Black licorice seems to be one of those flavors that you either love or hate. As for me, I'm definitely in the "love" category. I was one of those kids who got excited when people were giving away Good & Plenty boxes on Halloween and I pick the black jelly beans out of the mixture every Easter. 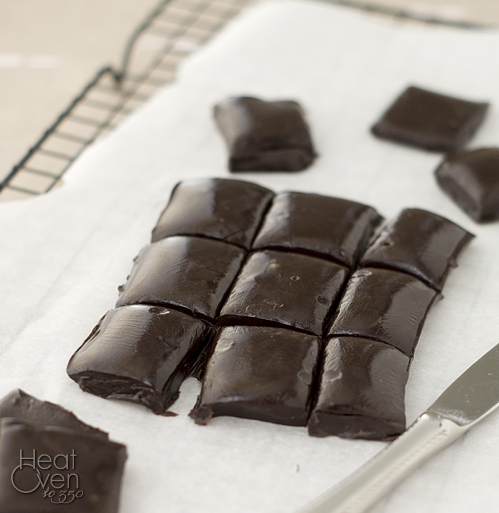 If you are a black licorice lover like me, or even if you are somewhat on the fence, this recipe is going to be a favorite. I promise. 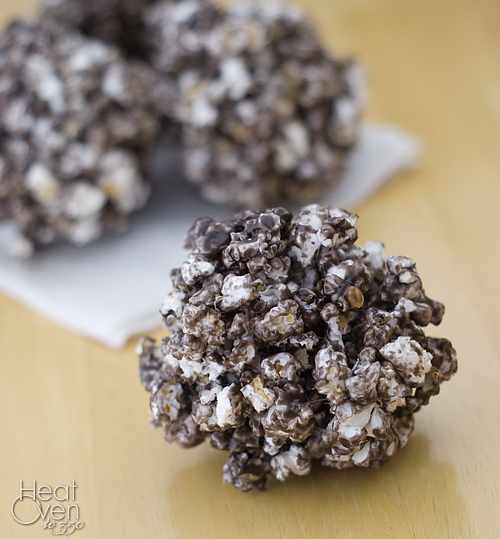 It's a chewy, buttery caramel with the distinctive black licorice flavor you know and love. If you've ever made homemade caramel you know that it is better than anything you can buy in the store, and the same thing is true about these black licorice caramels. The few minutes required to boil and stir the candy is well worth the reward of the warm, gooey bits you'll eat while you are waiting for the rest of the pan to cool. Can I say that these are edging out regular caramel apples as my favorite? And I'm a big caramel apple fan. I made the first one on a whim one time when I was making some black licorice to give away and I was surprised how well apple and black licorce go together. Have you ever had a fennel and apple salad? It's along the same lines. 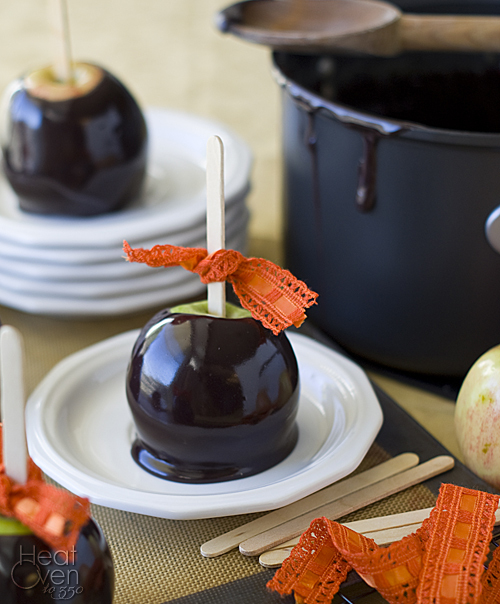 The touch of black licorice flavor makes regular caramel apples seem plain and boring, and I love how cool the caramel apples look covered in a layer of Halloween-y black. These little guys lasted about 5 minutes in my house before they were completely devoured. I'm actually amazed that I even got a chance to take a picture of them. However you decide to eat it, if you are a black licorice fan these caramels are a must-make in the near future. You won't be sorry. Removed from heat and stir in anise extract and food coloring. For candies: Pour hot caramel into an 8x8 pan lined with buttered foil or parchment paper. Let cool until just warm and cut caramel squares with a buttered knife. For caramel apples: Wash 12 medium apples thoroughly with water and slide a popsicle stick halfway through the core from the bottom part of the apple. (Washing takes off preservative waxes that make the caramel not stick. Putting the stick through the bottom instead of the top makes the finished apple stand better.) Working with one apple at a time, dip apples into caramel mixture, holding on to the popsicle stick and rolling the apple to get complete coverage. Let excess drip off and let cool on parchment paper. I can't lie, I'm definitely in the "hate" camp when it comes to black licorice (or anything licorice flavored at all). That said, those apples are seriously gorgeous!! Ok, those look stunning. And I am a HUGE black licorice fan. I've been wanting to try black licorice caramels for years. You just convinced me (plus I love how it looks on an apple - yum!). I'm absolutely in the LOVE category (and so are at least 2 of my 5 kids)! I saw the apple and the beautiful color...and was like..."licorice???" YUM! Going to have to try this. I'm so happy to hear from a fellow licorice fan! Hope you enjoy them as much as I do. Wow! I'm not a fan of black licorice but these look great. I am the kid (Tammie) who ate licorice flavored ice cream. Love black licorice! Great post Nicole. They are buttery tasting, but probably more chewy than soft. Let me know if they come close!